Can your kids find the hidden sight word in the frame? It’s the word “no”. Even though it was intentionally put in the bottom part of the frame, I just noticed it’s also in the top part, too. That’s like getting double bingo! You’re really supposed to have your kids look for all the j’s in this letter identification worksheet and circle them. The hidden sight words are just an added bonus. 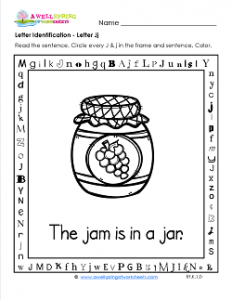 Circle every j in the sentence, “The jam is in a jar.” Be sure to color.